This Multi Monitor Stand Is Ready to Be Shipped Now! This Affordable Custom TV Rack is An Ideal Space-Saving Solution! Order a Multi Monitor Stand Before 1pm EST (M-F) For Same-Day Shipping! 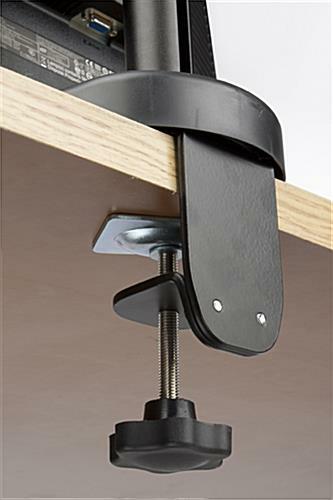 Mounting plate replaces detachable clamp to change temporary station into permanent work space! Dual brackets are quickly added or removed to hold (2) or (4) televisions! 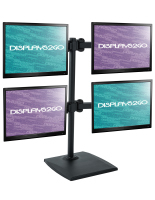 Articulating arms are height adjustable to change space between each display appropriately! Easily convertible from portrait to landscape orientation! A multi monitor stand, like this desk top rack with dual arms, can help to boost efficiency and decrease lead time on projects by granting (4) screen brackets for potential use. The design of this flat screen mount is intended to be versatile and provide many cost-effective features to all types of users! This dual level flat panel holder, multi monitor stand that is VESA compatible can accommodate numerous TVs measuring up to 27"! Although this is the maximum size screen, the suggested panel size is 17", which is an ideal size for rotation and adequate spacing between arms! This digital display rack, multi monitor stand with dual arms can be placed at any height level. 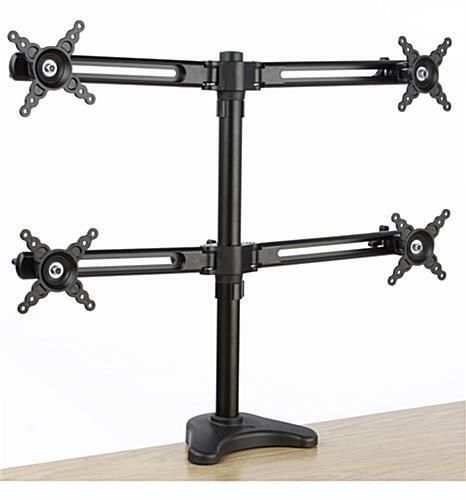 Customers who may not need as many multiple screen mounts are able to easily take away (1) of the (2) brackets to accommodate larger or smaller television screens. This multiple screen design, multi monitor stand with a detachable desk clamp is handy and includes a steel mounting bracket for fixed placement. An option like this creates additional value to users who want to keep the pole arrangement fixed into a table for security. A multi monitor stand that mounts multiple LCD flat panel televisions is often used by doctors, hospitals, digital designers and office professions that do not relocate often and need many panels for viewing! When fastened tightly onto a desk, these LCD display holders with dual arms are secure and stable! This multi monitor stand that has adjustable arms also has plastic clamps, which enable users to systematize power cables in an orderly, neat way. The rack displayed on this page is an affordable, reasonable choice for any business to use in an attempt to improve the quality, speed of work and output of work from employees! 27.0" x 23.5" x 6.0"